At the invitation of Philippe Étienne, Diplomatic Adviser to the President of the French Republic and Enzo Moavero Milanesi, Minister of Foreign Affairs of the Italian Republic, State Councilor and Foreign Minister Wang Yi will travel to France to attend the 18th session of the consultation of the coordinators for the China-France Strategic Dialogue, visit Italy and host the 9th Joint Meeting of China-Italy Government Committee from January 23 to 26. 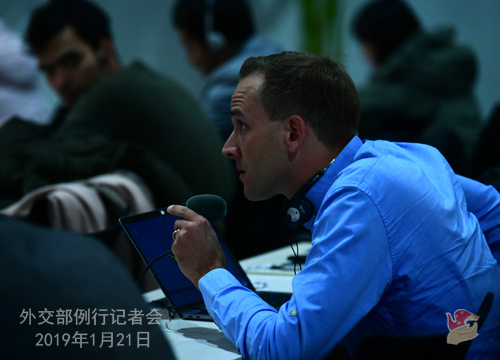 Q: Last week, the 2nd China-Germany High Level Financial Dialogue was held in Beijing. Could you brief us on the outcomes of this Dialogue? A: On January 18, member of the Political Bureau of the CPC Central Committee and Vice Premier of the State Council Liu He and German Vice Chancellor and Federal Minister of Finance Olaf Scholz co-chaired the 2nd China-Germany High Level Financial Dialogue in Beijing. This was the first high-level dialogue in the financial field between the two sides since China and Germany formed new governments. Under the theme of "expanding two-way opening-up, deepening practical cooperation and elevating China-Germany economic and financial relations to a new height", the two sides held discussions on macro-economic situation and policies and global economic governance, China-Germany strategic cooperation, financial cooperation and regulation. A series of fruitful and practical outcomes and many consensuses have been achieved. During this Dialogue, the two countries reaffirmed their commitment to strengthening macro-economic policy coordination, jointly upholding the rules-based and WTO-centered multilateral trading system, improving global economic governance, building an open world economy and promoting global economic growth. 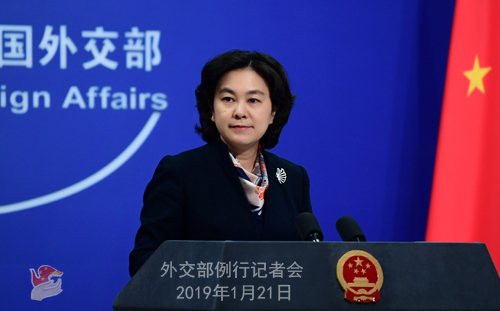 The two sides agreed to expand strategic cooperation, support the alignment of the Belt and Road Initiative with the Eurasian connectivity strategy and the European infrastructure planning and seek more practical cooperation in the third-party market. The two sides also inked the memorandum of understanding on cooperation between the central banks of China and Germany, letter of intent on banking supervision cooperation and the memorandum of understanding on securities and futures supervision cooperation. China and Germany, through this Dialogue, sent out the positive signal of jointly upholding multilateralism and economic globalization, enhanced mutual understanding and trust, expanded consensus on seeking common interests and promoted practical cooperation in the financial field. We believe that this Dialogue will play an important role in moving forward the China-Germany comprehensive strategic partnership. Q: According to Canadian media, mayor of Quebec City Régis Labeaume has cancelled a planned trip to China in March on the advice of authorities from the Quebec government office in Shanghai. Sources also said that it would be difficult for the mayoral delegation to secure meetings with Chinese counterparts. Can you confirm that? Also, the Canadian Prime Minister's Office issued a statement, saying that Prime Minister Justin Trudeau had a phone call with German Chancellor Merkel and thanked the German side for publicly supporting the Canadian side. Prime Minister Trudeau also held a phone call with Singaporean Prime Minister Lee Hsien Loong in which the dispute between Canada and China was raised. Do you have any comment? A: On your first question, the Chinese side is not aware of the traveling plan by the relevant Canadian side. We consistently support the two sides in carrying out normal exchanges at the sub-national level and between people of all sectors. On your second question, we have noted relevant reports. What the Canadian side has done only reminds us of one word-"bluff". First, the Canadian side has been using "Megaphone Diplomacy" and going all out to garner support, but these efforts will not change the nature of the case, nor help settle the relevant problem. Second, the Canadian side said that it thanked its "allies" who have publicly supported its stance. However, we haven't seen any information released by the German side. How come the Canadian side claimed that "Germany publicly supported it"? Besides Germany, the Canadian side also mentioned Singapore. But, according to media reports, the Singaporean side said that all countries need to follow due legal procedures when handling cases involving foreign citizens. This is correct. China is dealing with the relevant case in the spirit of the rule of law and strictly in accordance with legal procedures. We hope that the Canadian side could do the same. Once again, we urge the Canadian side to immediately correct its wrongdoings, respect the spirit of the rule of law, respect China's judicial sovereignty, and stop making irresponsible remarks. Q: It is reported that a US official days ago warned Israel to cancel its investment projects with China, especially the Haifa port project on the grounds of cyber security and intelligence concerns. An Israeli official who wants to remain anonymous responded that such security warnings against the Chinese are a joke. If China wants to gather intelligence, they can simply rent an apartment in Haifa instead of investing in ownership of a port. What is your comment? A: I have noted relevant reports. The US side has been abusing "national security" to smear and strike down normal business activities of Chinese enterprises. The US side has been consistently ignoring facts and seeing enemies wherever it looks. Even its allies find it ridiculous. Do you think we need to further comment on it? Q: China's Ambassador to Canada Lu Shaye said last week in an interview that if Canada blocks Huawei's 5G technology, there will be consequences for Canada. What is your comment? Why would China warn about consequences for a decision made by another government in this respect? A: Did you read Ambassador Lu Shaye's interview carefully? To my understanding, he did not mean that China intends to interfere in the decision-making of the Canadian government. We all know that Huawei is a leading supplier in the 5G technology, so losses are inevitable if Huawei is not chosen as a cooperation partner. Q: This morning, Israeli defense forces press service said Israel has conducted strikes last night on Iranian military bases in Syria. Syrian air defense facilities were also bombed after they had attacked the Israeli aircraft. It was the most powerful attack since May last year. I'm wondering if you have any comment on this? Will this affect the situation in the region? A: We have noted relevant reports. 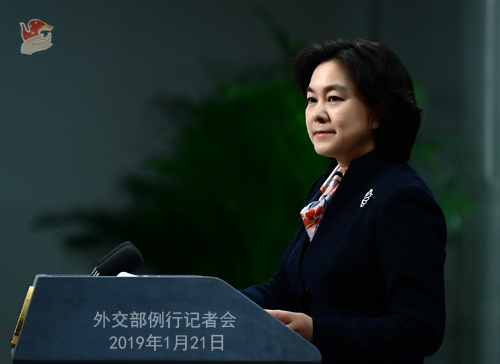 China always maintains that Syria's sovereignty and territory integrity should be respected and upheld. We are now seeing a rising momentum for a political settlement of the Syria issue. Instead of making any move that might escalate the tension, all relevant parties should work constructively to move forward the political settlement of the Syria issue and jointly uphold regional peace and stability. Q: On January 20, South Africa's President Cyril Ramaphosa, Kenya's President Uhuru Kenyatta, Tanzania's President John Magufuli, Burundi's President Pierre Nkurunziza and the Southern Africa Development Community have congratulated Felix Tshisekedi on winning the presidential election of the Democratic Republic of Congo (DRC). An EU spokeswoman said that doubts remain regarding the conformity of the result but pleaded for all sides to refrain from any action that could lead to violence. Presidential candidate Martin Fayulu issued a statement saying that he does not accept the ruling of the constitutional court, and he is the only legitimate president for the DRC and the nation should hold peaceful demonstrations. What is your comment? A: The Chinese side has noted that the DRC constitutional court has announced the final result for its presidential election. To have a smooth election makes a major event in the political life of the DRC. The government and people of the DRC have made tremendous efforts for this, demonstrating their wisdom and ability. The Chinese side commends that. We respect the choice made by the DRC people and express our congratulations to Mr. Tshisekedi on his election. China hopes that all relevant parties in the DRC will remain committed to promoting national peace, stability and development. We also hope that the external world could create favorable conditions for this. Q: Last weekend, CNN carried a Xinjiang-related report, citing the "personal experience" of a Uyghur woman named Mihrigul Tursun. She also talked about similar "experience" as a witness at a hearing of the US Congressional-Executive Commission on China on November 28, 2018. Recently, Rubio and other US Senators re-proposed the Uyghur Human Rights Policy Act at the Congress. What is your comment? I have also seen the report just issued by CNN. On January 18, that is last Friday, we received the questions raised by CNN via e-mail. CNN said that recently it interviewed a Uyghur woman named Mihrigul Tursun, who claimed that one of her sons died in Urumqi's Children's Hospital in 2015 and she witnessed the death of nine Uyghur women when she was detained in Urumqi's prison. CNN hopes that we can respond to that. After receiving the questions, we attach high importance to that and immediately verified relevant information with the competent authority of the Xinjiang Uyghur Autonomous Region. But obviously, CNN was not willing to wait for the result of the verification and it has issued relevant report last weekend. Since you raised this question, I would like to take this opportunity to clarify the facts. According to the feedback we got from Xinjiang's competent authority which has conducted careful verification on this issue, I want to make the following clarifications. First, the Uyghur woman named Mihrigul Tursun CNN's report mentioned used to be a resident in Qiemo County of Bazhou, Xinjiang. In August 2010, she registered for marriage with an Iranian in China. In January 2012, she registered for marriage with an Egyptian in Egypt. According to the information offered by Mihrigul herself, in April 2015, she gave birth to three children in Egypt, namely, Muezi, Ailinna and Muaizi. Muezi and Ailinna were registered for permanent residence in October 2015. In March 2018, Mihrigul's Egyptian husband told the public security bureau of Qiemo County that Mihrigul has gained Egyptian nationality. After seeking the opinion of Mihrigul and receiving her application for nullifying Chinese nationality, the public security bureau of Qiemo County deregistered the permanent residence of Mihrigul, Muezi and Ailinna on April 2. On April 22, Mihrigul and her husband left the country with Muezi and Ailinna on Egyptian passports. Second, on April 21, 2017, Mihrigul was taken into custody by the public security bureau of Qiemo County on suspicion of inciting ethnic hatred and discrimination. During this period, she was found to have infectious disease. Out of humanitarian consideration, the public security bureau of Qiemo County terminated the compulsory measures against her on May 10, 2017. Apart from the twenty days' criminal detention, Mihrigul was totally free during her stay in China. According to relevant records, from 2010 to 2017, Mihrigul traveled between China and Egypt, UAE, Thailand and Turkey eleven times. In a nutshell, Mihrigul has never been detained by police in Urumqi. Neither has she been jailed or received penitentiary education in any vocational education and training center. I don't know on what basis she went as far as to claim that she witnessed the death of nine women during her detention and she was detained by the police in a cell with over 50 women in the interview with CNN and at the hearing of the US Congress! Third, according to our verification, Muezi, one of Mihrigul's sons, because of pneumonia, hydrocephalus and right-side indirect inguinal hernia, was taken by Mihrigul and her family to Urumqi's Children's Hospital for hospitalization on January 14-19, May 6-12 and November 4-8 respectively in 2016. In April 2018, Mihrigul and her husband left China with their son, Muezi on Egyptian passports. As to the other son of Mihrigul Muaizi, he was not registered for permanent residence in China. In January 2016, Muaizi was taken by Mihrigul from China to Turkey and entrusted to the care of her husband's cousin, Samar. We are not aware of what happened after that, but Mihrigul herself must be very clear about that. Therefore, Mihrigul's claim that one of her sons died in Urumqi's Children's Hospital and that she was not informed of the reason for the hospitalization of her son, as reported by CNN, does not tally with the facts and is a lie fabricated with ulterior motives. This is what we learned from the competent authority of Xinjiang. These are the facts about Mihrigul. In addition, I want to stress the following two points. First, respecting truth is the lifeline of media reports. You may still remember the scandal of Claas Relotius, a well-known journalist working for Der Spiegel at the end of last year. The sources of many of his award-winning reports on Syria were proved to be fictional. Recently, some western media's Xinjiang-related reports seem to have cited many sources with exact names, but then it proved that these people are non-existent or what they cited is not true. This report released by CNN is just the latest example in this regard. We hope that relevant media can strictly observe the professional ethics of the press, cherish their credibility and refrain from citing fake news or made-up stories. Second, on November 28, 2018, Mihrigul talked about her so-called "experience" at a hearing of the US Congressional-Executive Commission on China in the capacity of a witness, which became an important basis for Senator Rubio and others to propose and promote the Uyghur Human Rights Policy Act. The US congressmen levied unwarranted accusations on and defamed the Chinese government and China's ethnic policies based on a liar's made-up story. We can by no means accept that. We urge the relevant US congressmen to respect the basic facts, abandon ideological bias and the Cold War mentality, and stop maliciously slandering and smearing China's policies on religion and the governance of Xinjiang. As to such kind of farce, once is enough, otherwise it will further chip away at the credibility of these congressmen and the US. Q: Ri Su Yong, member of the Political Bureau of the Workers' Party of Korea (WPK) Central Committee and Director of the party's International Department will lead an art troupe to China. Do you have more details, like the time, location and name of the art troupe? A: The International Department of the CPC Central Committee has released relevant information. At the invitation of the International Department of the CPC Central Committee, Ri Su Yong, member of the Political Bureau of the Workers' Party of Korea (WPK) Central Committee, Vice-Chairman of the WPK Central Committee and Director of the party's International Department will lead an art troupe to China for performance tours starting from January 23. As for the details of this visit, so far, I haven't got any information to offer. Q: Some western scholars and officials have raised concerns that the arrest of Canadians Michael Kovrig and Michael Spavor has created a chilling effect that will affect exchange and understanding between other countries and China. What is China's response? A: I wonder who these western scholars and officials are and how much do they know about the real situation regarding the cases of the two Canadian citizens? The Chinese side has made it very clear. Canadian citizens Michael Kovrig and Michael Spavor were taken compulsory measures by relevant Chinese departments in accordance with the law for their involvement in activities undermining China's national security. Our attitude regarding foreigners is clear. We welcome foreign citizens to come here and engage in normal and friendly exchanges. As long as they abide by Chinese laws and regulations, there is nothing to worry about. Q: A pipeline explosion in central Mexico's Hidalgo State on the evening of January 18, local time has killed 79 and injured 75. What is your comment? A: China has noted that the pipeline explosion accident in central Mexico has caused major casualties. We are deeply saddened by that. President Xi Jinping has sent a message of condolence to President Lopez at the earliest time possible to express deep condolences to the victims and sincere sympathy to the bereaved families and the injured. State Councilor and Foreign Minister Wang Yi has sent a message of condolence to Mexican Foreign Minister Marcelo Ebrard. China will stay in touch with the Mexican side and stand ready to offer necessary assistance. Q: Just to clarify on the question on Chinese Ambassador Lu Shaye. You were saying Canada will suffer commercial consequences if it doesn't use Huawei 5G technology. The Chinese government itself is not threatening political, diplomatic or other consequences to Canada if it makes this decision? A: You are so interested in this issue, but have you heard of any threats from the Chinese government? It is the Canadian side who has kept threatening over and over, not the Chinese side. We have been reasoning with the Canadian side, not threatening it. Indeed, the current state of the China-Canada relations has inevitably caused a huge impact on bilateral exchanges and cooperation, which is the last thing we want to see and is certainly not of China's making.